Newspaper report from the 1913 on the new Rail Motor Service. A new rail motor service, between Lytham and Blackpool, came into operation last Monday, without any formal ceremony of any description. The new service supplements the ordinary train service every day except Saturday, and there are ten journeys each way daily. The, service has been so arranged as to abolish many of the long intervals between trains. A feature in connection with the service is the establishment of halts at Gillett's Crossing (near the Old Links Golf Club), and at Burlington Road, South Shore. The motor train only stops at these halts. Residents on the northerly side of St. Annes, as well as golfers, will find the halt at Gillett's Crossing a very great convenience. The fare to Gillett's Crossing is 1d., and from Gillett's Crossing to Blackpool Central 3d. 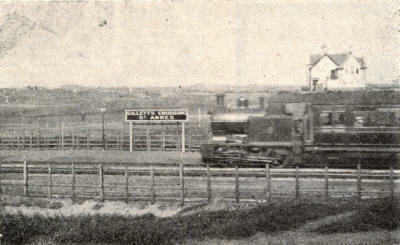 Photograph of the motor rail train at Gillett's Crossing. The service came into operation last Monday, and will be popular as it increases, greatly, the railway facilities between Blackpool, St. Annes and Lytham. The absence of ceremony, on Monday, was a contrast to the original opening of the line from Lytham to Blackpool, on February 16th, 1846, when there were local rejoicings and passengers were allowed free tickets. St. Annes, of course, was not even planned in those days, and the nearest station was known as Stoney Hill, in the neighbourhood of Squire's Gate. The line between Lytham and Blackpool was started as a private company, in which there were only about eight shareholders, including the Cliftons and Birleys, and a Mr. Swainson, of Manchester. There were two engines, eighteen carriages, and two horse-boxes. The L. and Y. Railway terminus, at Lytham, was situated where the goods station now stands, and temporary rails were laid along the site of Westby Street, and the carriages were run along the rails.